Blue Bunny Sweet Freedom No Sugar Added Ice Cream! You are here: Home / Sponsored / Blue Bunny Sweet Freedom No Sugar Added Ice Cream! This is a sponsored post written by me on behalf of Blue Bunny Ice Cream for IZEA. All opinions are 100% mine. I have told you before about how I was diagnosed with Type II Diabetes and how I lost the weight and no longer have it. But, I watch my diet very closely. I do very little carbs and Hubby and I now are sugar free – as in no sugar added. We don’t eat foods that have sugar added to them. 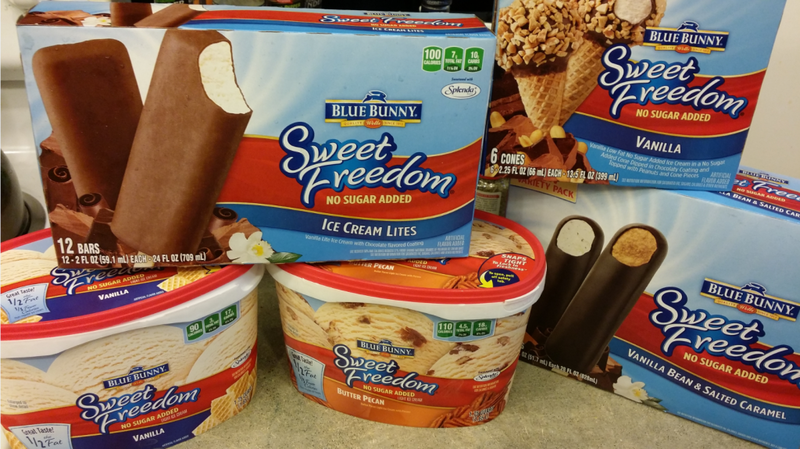 So, I cannot tell you how excited we were when we found out that Blue Bunny® has this great line of No Sugar Added Ice Cream called Blue Bunny® Sweet Freedom Sugar Free Ice Cream! But, wait! It tastes – AWESOME! No lie! I love it! The selection varies from Snack Size Cones, Ice Cream Sandwiches to Butter Pecan Ice Cream. I also LOVE that when the grandkids come over I can offer them ice cream with no worries about it having sugar (added sugar) in it! They love it, too! They always ask for it when they come over. When I lost the weight and was watching what I ate, I didn’t even look at the ice cream aisle, at all! I was shocked when they contacted me and wanted me to share it with my readers. I had no idea this even existed, but, I am so happy they reached out to me! Since October is National Diabetes Month, it’s the perfect time to share this info! If you are or know of someone who is a Diabetic or who is sugar free, be sure to tell them about this line of ice cream so they can try it, I promise they will love it. Even if you’re not sugar free or a Diabetic it’s a great guilt free treat!